Baylor QB Bryce Petty led his team to their eight consecutive win. 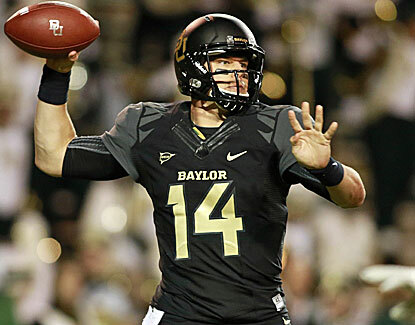 For the third year in a row, Baylor has a new starting quarterback. Just like his two predecessors, junior Bryce Petty has been lighting up defenses. Coming into their home game against the Oklahoma Sooners, the Bears were 7-0 and 6th in the BCS standings. In seven games, the Bears had outscored their opponents 447 – 111. However, the Bears wins were against an unimpressive lineup of Wofford, Buffalo, UL Monroe, West Virginia, Kansas State, Iowa State and Kansas. The Oklahoma game would be their first real test of the season. The Oklahoma Sooners came in as a team that really hadn’t found their identity, but were still ranked #10 in the BCS standing. The Sooners were 7-1, but lost to Texas in the Red River Rivalry. Since losing quarterback Landry Jones to the NFL, Oklahoma has struggled to find their offensive identity. The Sooners have played two quarterbacks, but neither junior Blake Bell nor redshirt freshman Trevor Knight has been the answer. Scoring started out slowly as both teams seemed to be feeling each other out. Both teams punted on their first possession. In Baylor’s first seven games, they were known for their quick strike scores. Their first score, however, was the result of 55 yard drive in 13 plays. The focal point of the drive was the running of Glasco Martin. The big play of the drive was a 28 yard pass from Petty to junior receiver Clay Fuller. The drive stalled at the Oklahoma 12 yard line and Baylor settled for a 29 yard field goal to take a 3-0 lead. The two teams continued to trade punts and Baylor held their lead at the end of the first quarter. Early in the 2nd quarter, Oklahoma was threatening. They drove the ball just short of the Baylor goal line, but the Bears defense stood tall. On 4th and 1, Bell was stopped short of the goal by junior corner K.J. Martin and the Bears took over on downs. The Sooners were able to take advantage of the poor field position given to Baylor when two plays later, Petty was sacked by freshman linebacker Dominque Alexander in the end zone. The safety cut Baylor’s lead to 3-2. On the free kick, Sooner return man Jalen Saunders returned the ball 54 yards to set up Oklahoma at the Bears’ 12 yard line. The Baylor defense again did its’ job and Oklahoma had to settle for a field goal and a 5-3 lead. Midway through the 2nd quarter, Baylor was able to get the first touchdown of the game. 20 yard runs by freshman running Shock Linwood and by Petty put the Bears into scoring position. Petty ran the ball in from 5 yards out to put the Bears back up 10-5. It was a lead they would never give up the rest of the game. After forcing an Oklahoma punt, Baylor struck again. A 39 yard pass from Petty to junior receiver Levi Norwood gave the Bears the ball at the Oklahoma 12 yard line. Petty capped off the drive with a 1 yard run, his second rushing TD of the night, and the Bears led 17-5 with 1:00 to go until the half. The Bears were not done though. On Oklahoma’s first play from scrimmage, Bell was picked off by senior linebacker Eddie Lackey at the OU 38 yard line. Five plays later, Petty hit junior receiver Antwan Goodley for a 24 yard touchdown to make the score 24-5 at the half. The swarming Baylor defense continued to make life miserable for the Oklahoma offense in the 2nd half. Oklahoma was forced to put on its’ first two possessions. After pinning the Sooners deep on their own 4 yard line, the Bears got excellent field position when the Oklahoma punt only went 31 yards, giving the Bears the ball at the OU 34 yard line. Five plays later, Petty hit Norwood for a 17 yard score to increase their lead to 31-5. The Sooners were finally able to mount a touchdown drive on their next possession. Using a 19 yard run by Saunders and 23 yard run by senior running back Roy Finch, the Sooners moved the ball into the red zone and Finch scored on a 10 yard pass from Bell to cut the lead to 31-12. After the touchdown, the Bears gashed the Sooners with their running game. Linwood hurt the Sooner defense with runs of 39 and 17 yards. The Sooners, however, were able to hold the Bears and force a field goal. The Bears led 34-12 heading into the final quarter. With a 22 point lead, the Bears turned to their running game to milk the clock. Linwood ended up with a career high 182 yards on 34 carries. Midway through the final period, Baylor got one last score. Petty hit junior receiver Antwan Godley from 25 yards out to make the final score 41-12. With the win, the Bears proved they are for real. Their offense is a force to be reckoned with and their defense, once the weak link of the team is playing very well. They don’t have a big defense, but it is extremely fast and they swarm to the ball. Although Baylor made a statement in this game, it is hardly over for them. They enter into the toughest part of their schedule with home games against Texas Tech and Texas and traveling to Texas Tech and TCU. It won’t be easy, but if they continue to play the way they did against Oklahoma, they have a real shot at remaining undefeated. I can’t say enough about the job that coach Art Briles has done in Waco. It’s one thing to win with a Heisman winning quarterback, it’s completely different to keep winning and changing quarterbacks every year. Baylor has become the hottest place to go, especially for players with good speed. This may be the fastest team top to bottom outside of Oregon. Oklahoma continues to struggle against good teams. They just have not found a rhythm offensively and at times are inept on offense. They have winnable games against Iowa State and Kansas State before heading to Stillwater to play Oklahoma State in the annual Bedlam game. They have 7 wins, so they are bowl eligible, but with 2 losses it will be tough for them to win the Big 12 title. Bryce Petty, QB, Jr: Protects the ball. Great TD-INT ratio. Big and strong. Stands strong in the pocket. Nice touch. Deceiving runner. Eludes the rush well. Throws well on the run. Loves to attack the defense. Great ball location. Completed 13/26 for 204 yards and 3 TD. Carried the ball 16 times for 45 yards and 2 TD. Also converted a 4th and 1 with a QB sneak. Glasco Martin, RB, Sr: Good short yardage runner. Left in the 1st quarter, possible knee/leg injury. Had 6 carries for 13 yards before getting injured. Converted a 4th and 1. Lache Seastrunk, RB, Jr: Transfer from Oregon. Good combination of size, strength and speed. Good cutback ability. Able to bounce the play outside. Left 2nd quarter with a possible hamstring injury. Tried to return but was not effective. Had 6 carries for 19 yards. Antwan Goodley, WR, Jr: Great hands. Tough to bring down. Very good on the back shoulder catch. Led the team with 6 receptions for 80 yards and 2 TD. TD catches were from 24 and 25 yards. Had offensive pass interference penalty. Levi Norwood, WR, Jr: Slips tackles. Runs with determination. Able to return punts and kicks. Had 4 catches for 78 yards and 1 TD. Had a 39 yard catch. Had a dropped pass. Clay Fuller, WR, Jr: Great body control. Had 3 catches for 46 yards. Had a 28 yard catch. Cyril Richardson, G, Sr: Nasty run blocker. Key to the inside run game. Terrance Lloyd, DE, Sr: Quick, active pass rusher. Good speed rusher. 1 tackle, 1 tackle for loss, 1 sack, 1 QB hurry. Chris McAllister, DE, Sr: Reads keys and stays at home. Plays well in space. Great outside containment. 3 tackles, 1 1 ½ tackles for loss, 1 QB hurry. Eddie Lackey, LB, Sr: Always around the ball. Stops ball carrier in his tracks. Good form tackler. Does a good job in pass defense. Able to read the QB and break on the ball. Had 8 tackles, 1 tackle for loss and 1 QB hurry. Bryce Hager, LB, Jr: Son of former Longhorns and Eagles linebacker Britt Hager. Heady defensive leader. Instinctive. Gets everyone lined up in the right spot. Runs sideline to sideline. Had 7 tackles and 2 QB hurries. Demetri Goodson, CB, Sr: Former Gonzaga point guard. Plays tight man coverage. Plays with confidence. Does a good job undercutting the receiver to get his hands on balls. Uses great technique. Good open field tackler. Had 2 tackles and 3 pass breakups. Had an interception that he returned 42 yards. Had a personal foul penalty. K.J. Morton, CB, Sr: Very physical which sometimes hurts his team. Very good in run support. Had 7 tackles and 1 ½ tackles for loss. Had a big 4th down stop on goal line stand. Had a targeting penalty, but allowed to stay in the game. Joe Williams, CB, Sr: Very athletic. Uses good technique to separate the ball from the receiver. Had 1 tackle and 2 pass breakups. Sam Holl, S, Sr: One of several hybrid players for the Bears. Plays off blocks well. Understand passing angles. Had 5 tackles, 1 tackle for loss and 1 PD on 4th down. Ahmad Dixon, S, Sr: Closes quickly on the ball. All over the field. Good open field tackler. Had 10 tackles, 1 tackle for loss on 3rd and 1, 1 pass breakup and 2 3rd down stops in the red zone. Blake Bell, QB, Jr: Tough runner. Very good on short yardage runs. Struggles with accuracy, especially against good teams. Completed 15/35 for 150 yards 1 TD, 2 INT. Carried the ball 8 times for 5 yards. Brennan Clay, RB, Sr: Good burst through the hole. Had 6 carries for 19 yards. Had a dropped pass. Damien Williams, RB, Sr: Good inside runner. Has good cutback ability. Had 7 carries for 13 yards. Had 2 catches for 12 yards. Roy Finch, RB, Sr: Small and explosive. Versatile. Ability to contribute in the pass and kicking games. Gets to top end speed extremely quickly. Led the team with 7 carries for 36 yards. Had a 23 yard run and a 10 yard touchdown catch. Jalen Saunders, WR, Sr: Dangerous return man. Makes people miss. Dynamic in space. Led the team with 6 receptions for 74 yards. Had a 28 yard catch and a 54 yard return from a free kick. Jaz Reynolds, WR, Sr: Good on screen passes. Follows blockers well. Had 3 catches for 31 yards. Geneo Grissom, DE, Jr: Very athletic. Former TE. Had 6 tackles and 1 tackle for loss. Aaron Colvin, CB, Sr: Plays tight man coverage. Plays with good inside position. Tackles well. Had 3 tackles. Julian Wilson, CB, Jr: Physical. Able to cover slot receivers. Had 1 tackle and was called for a holding penalty. Quentin Hayes, S, Jr: Great on delayed blitz. Very good in the box. Had 10 tackles, 1 tackle for loss and 1 sack. Gabe Lynn, S, Sr: Makes plays on the ball. Had 4 tackles. This entry was posted on November 12, 2013 by draftmaniacs in Scouting reports and tagged 2014 NFL draft, Baylor Bears football, NFL, NFL Draft, Oklahoma Sooners football.